Processes of national research assessment, such as Excellence in Research for Australia (ERA) are a type of audit technology that confronts and steers established institutional identities and traditions. This nexus between policy and practice drives boundary work that diffracts prevailing policy logics, organisational practices, and habits of mind. We use this notion of ‘boundary work’ as an analytical lens for understanding the nature and effects of ERA in the Australian educational research space. This paper explains the methodology that informed the AARE–ACDE research reported in Strategic Capacity Building for Australian Educational Research. It documents the policy logic of ERA and the way it cuts across the established ecology of educational research, revealing social and symbolic work that is remaking the boundaries of educational research. We report on the historical trajectory of Australian educational research, the way ERA codes research outputs, and how educational researchers are repositioning in this shifting research space. We argue that there are specific loci of boundary work where capacity building in Australian educational research can make a difference to future educational knowledge building. We thank Ruth Morton, Joce Nuttall, Michele Simons and an anonymous reviewer for their helpful contributions to this paper. ABS (2008). A new research classification for a new century, Media Release, 31/3/2008. Retrieved May 13, 2013, from http://www.abs.gov.au/ausstats/abs@.nsf/Latestproducts/1297.0Media%20Release12008?opendocument&tabname=Summary&prodno=1297.0&issue=2008&num=&view. ABS (2013). 1297.0-Australian and New Zealand Standard Research Classification (ANZSRC), 2008. Retrieved January 31, 2013, from http://www.abs.gov.au/ausstats/abs@.nsf/Latestproducts/1297.0Main%20Features32008?opendocument&tabname=Summary&prodno=1297.0&issue=2008&num=&view. ARC (2010). Excellence in Research for Australia, Evaluation Guidelines. Retrieved January 31, 2013, from http://www.arc.gov.au/pdf/ERA2010_eval_guide.pdf. ARC (2011). ERA 2010 National Report. Retrieved July 9, 2012, from http://www.arc.gov.au/era/era_2010/outcomes_2010.htm. ARC (2013). ERA 2012 Journal List. Retrieved June 3, 2013, from http://www.arc.gov.au/era/era_2012/era_journal_list.htm. Kwok, J. K., (2013). Impact of ERA research assessment on university behaviour and their staff. Melbourne: NTEU National Policy and Research Unit. Retrieved May 27, 2013, from http://www.erawatch.org.au/2013_nteu_report. Larkins, F. (2013). ERA 2012 (Part 2): Discipline research profile changes 2010 to 2012, L.H.Martin Institute, Melbourne University. Retrieved April 26, 2013, from http://www.lhmartininstitute.edu.au/insights-blog/2013/03/118-era-2012-part-2-discipline-research-profile-changes-from-2010-to-2012. Pons, X. & VAN Zanten, A. (2007). Knowledge circulation, regulation and governance, KnowandPol project, deliverable 4, R&D EU Sixth Framework program. Retrieved May 5, 2013, from www.knowandpol.eu. Seddon, T., Bennett, D., Bobis, J., Bennett, S., Harrison, N., Shore, S., Smith, E. & Chan, P. (2012). 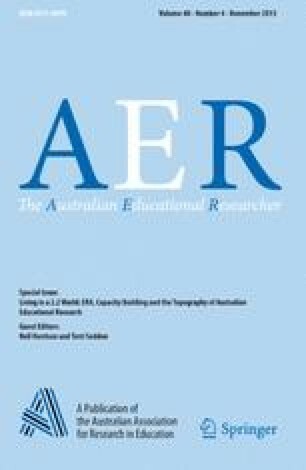 Living in a 2.2 world: ERA, capacity building and the topography of Australian educational research. Retrieved May 5, 2013, from http://www.aare.edu.au/pages/page116.asp.